Each of Santa’s letters are unique and magical. Santa delivers a completely different letter to each child in your home – with details and narrative that bring wonder and joy. Fully personalised for each child using real life details unique to that child - that only Santa would know! Printed on Santa’s custom-made high quality thick notepaper (Santa obviously doesn't use normal paper!) 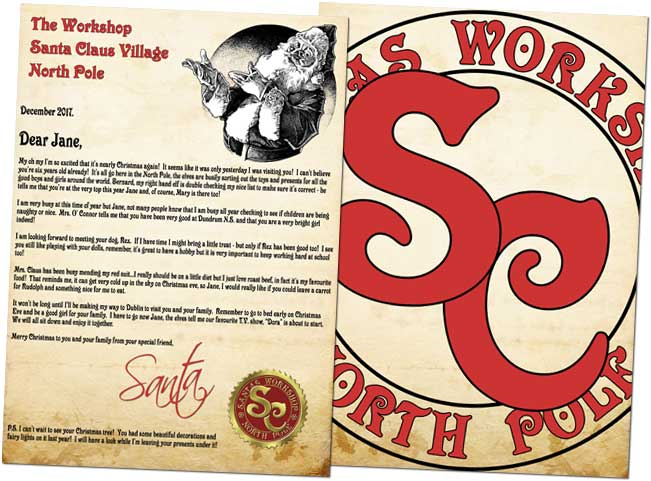 – finished in full colour on both sides and features Santa’s Official North Pole Workshop emblem. Santa places his official gold foil emblem on each and every letter - Just to 100% prove that the letter came from Santa himself. 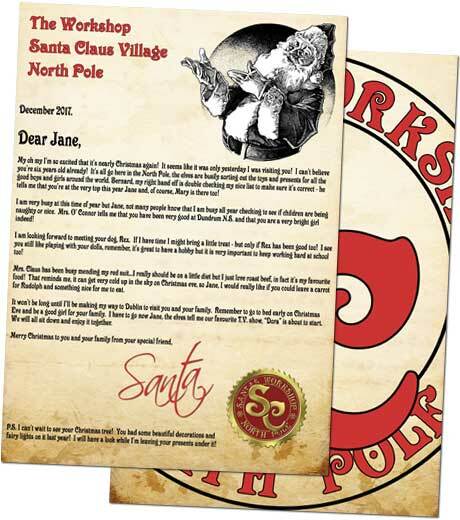 Santa's letters are posted to arrive from the beginning of December - so you can order anytime! Okay, now we need to collect details for each letter. Please by careful...we want to ensure all letters are perfect! So we hope you check your spelling and check it twice! Santa needs to know where to send his letter(s) and some information about each recipient. Nearly finished! Please provide details of the recipient's pets, school, hobbies etc. 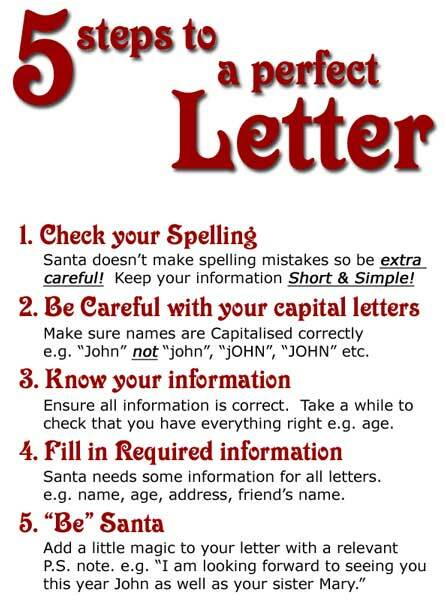 As always please double check your spelling...Santa wants to ensure he gets everything right! To finish the letter, Santa will write a P.S. note to your recipient. This is your chance to really personalise this letter! REMEMBER, write the P.S. Note as though Santa himself was writing it! Take your time and remember to make this note as relevant as possible. Don't worry if you can't think of anything, just leave the field blank and Santa will write a P.S. note for you! *** Please do not insert Emoji as Santa can't print these. 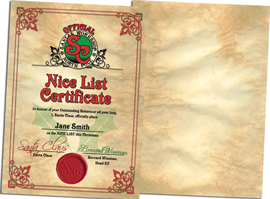 If you wish – Santa will issue his official, Personalised Nice List Certificate – together with the letter (In the same envelope). 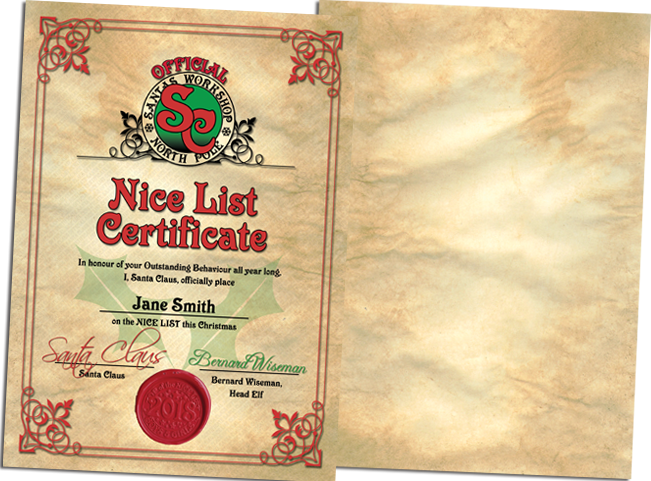 This Certificate will be made out in the name of your child - and will confirm, without doubt that your child is offically on the Nice List – what better award could possibly be received! 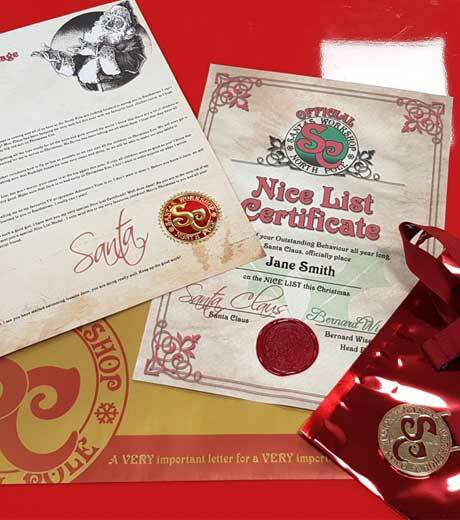 The Certificate is produced on Santa's custom-made certificate paper – with each certificate receiving another hand-pressed large wax seal. 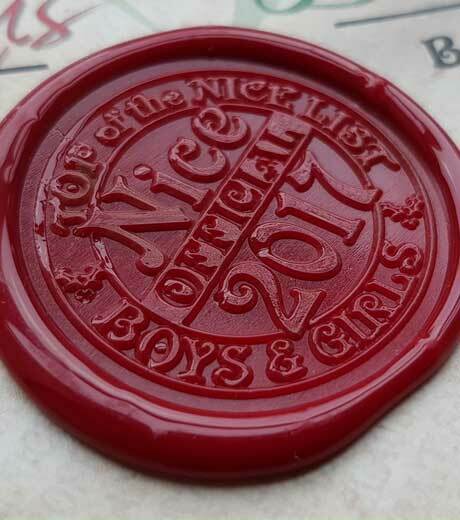 Santa gets a new seal custom-designed and engraved each year to ensure its offical status is without doubt! Santa’s Official Nice List Medals are, you guessed it, custom-made and full of quality and detail that will be the most cherished medal in your home throughout Christmas! These metal medals are finished in shiny gold with beautiful burgundy detail etched into each one. 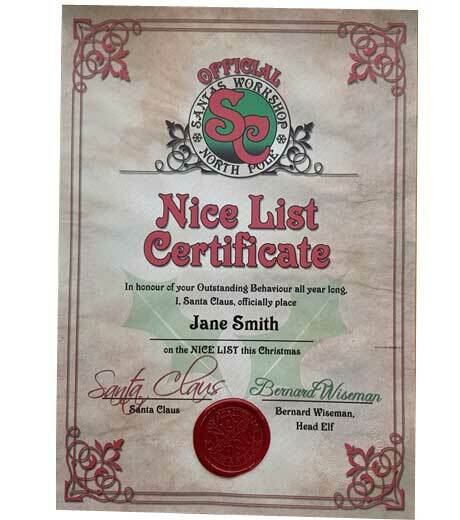 The front features Santa’s official North Pole emblem – the same one that’s on Santa’s letters and Official Nice List Certificates. The back has the words “On The Nice List” engraved and inlaid with burgundy enamel. 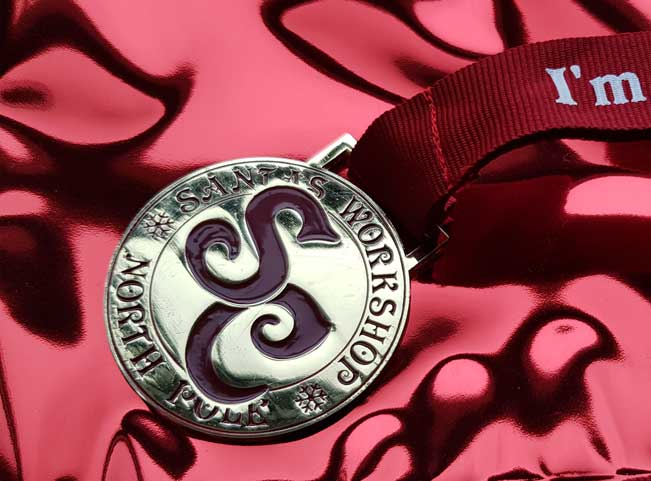 Each medal has a fabric lanyard with the words “I’m On Santa’s Nice List”, and a safety clasp – because safety is always the most important thing! Please provide your contact details so that we can send you a confirmation of your order and contact you with any queries relating to your order with us. Tick this box if you would prefer not to receive emails and text messages with our latest offers. We may also send you emails and text messages relating to your order. See our privacy statement for further details. 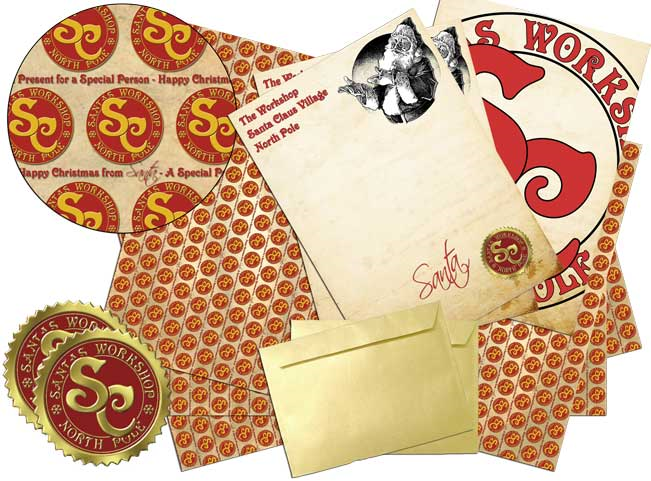 Two sheets of Santa’s special custom-made heavy notepaper – so Santa can leave a special message on Christmas morning! Two of Santa’s custom-made C5 gold envelopes to complete the magic. The length and quality of a child's letter is dependent on the choices you make and the accuracy of the information we are given by you. Whilst we make every endeavor to ensure that this information is correct it is your responsibility to ensure the accuracy or this data. There are limited quantities available on some of our “non-letter” items on our website. If an item should become unavailable at the time your order is processed, we will issue you a full refund. In addition, if a particular stationary should be “out-of stock” we reserve the right to replace it with one of our other stationary types of equal or greater value. We accept VISA, MasterCard, Laser and Maestro. Payment is due upon placing an order, and your credit card will be billed at the time you place your order. Shortly after your order is processed, you will be sent an email confirmation containing your order number. The pricing for letters includes all shipping costs. Additional shipping costs may be added at the time of checkout for all other items ordered through the Service. All pricing associated with the Service is subject to change at any time. All letters are sent via An Post. We’ve selected a cut-off date of December 16th to receive orders to ensure all letters are delivered on time. We will not be responsible for the late delivery of letters or other items ordered on or after December 16th. Santa Knows Me licenses you the non-exclusive, non-transferable right to use the service and related software. However, Santa Knows Me retains all ownership and all rights in and to the service and related software. In addition, Santa Knows Me retains all rights in and to the graphical elements, web page designs and other custom work relating to provision of the service. Nothing herein shall constitute an assignment of rights or other transfer of ownership in or to the service, related software, graphical elements, web page designs, etc. You will not attempt to copy the software used in connection with this service. You will not attempt to reverse engineer or make any modifications to the software used in connection with the service. (a) Lawful Use Of Service. You represent and warrant that you will only use the service provided by Santa Knows Me for lawful purposes, and that you will not order letters be sent to any child contrary to the wishes of the child’s parent(s) and/or legal guardian(s). (b) Web Browser Compatibility Website Operation. You acknowledge that different web browsers will interpret web pages differently. Although Santa Knows Me will use its reasonable efforts to ensure that the Service is compatible with a number of different web browsers, Santa Knows Me does not warrant the way that the Service will appear on different browsers. In addition, every effort is made to keep the website up and running smoothly. However, Santa Knows Me takes no responsibility for, and will not be liable for, the website being temporarily unavailable due to technical issues relating to the Internet and/or the website. (c) Warranties Not Expressly Provided. Santa Knows Me makes no representations or warranties relating to the Service. Santa Knows Me MAKES NO WARRANTIES OF ANY KIND, WHETHER EXPRESS OR IMPLIED, FOR THE SERVICE. Santa Knows Me expressly disclaims all implied warranties, including without limitation, the implied warranty of merchantability or fitness for a particular use, relating to the Service or this Agreement. Under no circumstances will Santa Knows Me be responsible for any damage or loss suffered by you. This includes loss resulting from delays, non-deliveries, mis-deliveries, or service interruptions including those caused by the negligence of Santa Knows Me, its officers, employees, agents or customers. Santa Knows Me also disclaims any responsibility for the accuracy or quality of information obtained or disseminated through the Service. You release Santa Knows Me from any harm or loss that may result from your use of the Service. (d) Limitations Of Remedies And Liability Relating To Products Sold. While some of the products sold by Santa Knows Me may be warranted by their respective manufacturers, Santa Knows Me does not warrant in any way the products its sells. EXCEPT AND TO THE EXTENT EXPRESSLY PROVIDED HEREIN, Santa Knows Me DOES NOT WARRANT THE PRODUCTS IT SELLS. ALL PRODUCTS ARE PROVIDED ON AN “AS IS” BASIS, WITHOUT ANY WARRANTIES OF ANY KIND FROM Santa Knows Me, INCLUDING WITHOUT LIMITATION ANY IMPLIED WARRNATIES OF MERCHANTABILITY OR FITNESS FOR ANY PARTICULAR PURPOSE. YOU ASSUME THE ENTIRE LIABILITY FOR THE SELECTION AND USE OF ANY PRODUCTS SOLD BY Santa Knows Me, AND Santa Knows Me SHALL NOT BE LIABLE TO YOU FOR ANY INCIDENTAL, SPECIAL, CONSEQUENTIAL OR INDIRECT DAMAGES, EVEN IF Santa Knows Me HAS BEEN ADVISED OF THE POSSIBILITY OF SUCH DAMAGES. (e) Indemnification. You agree to indemnify, defend, and hold Santa Knows Me, its partners, employees, representatives, agents, and the like harmless for any claim relating to your use of the service and/or the transmission of letters to children that you may order, liability, debt, or other obligation arising out of or as a result of or relating to this agreement or the service. This indemnification includes, but is not limited to, attorneys' fees and expenses. (f) Limitation of Liability. In the event Santa Knows Me is unable to provide its services, you agree that Santa Knows Me’ liability for such failure with all other damages relating thereto shall not exceed the amount that you paid to Santa Knows Me. Santa Knows Me shall be excused from delays in performing or from its failure to perform hereunder to the extent that such delays or failures result from causes beyond the reasonable control of Santa Knows Me. You expressly acknowledge that Santa Knows Me sends all letters ordered through the U.S. Postal Service, and that Santa Knows Me has no ability to control how or whether the U.S. Postal Service delivers or fails to deliver letters ordered. (a) Entire Agreement Modification. This agreement sets forth the entire agreement and understanding between the parties hereto, and supersedes all prior understandings, agreements, and documentation relating to the subject matter hereof. This agreement cannot be amended, modified or changed orally. This agreement may not be altered or amended except by a writing signed by both parties. (b) Construction of Disclaimer and Agreement. If any provision of this agreement is found to be void or unenforceable, it shall be deemed omitted and the remaining agreement shall remain in effect. (c) Governing Law and Venue Mandatory Expedited Mediation. This agreement shall be interpreted under the laws of the State of Florida without reference to Florida’s conflict of law provisions. You irrevocably agree that any dispute arising out of or otherwise related to the Service or to Santa Knows Me or this Agreement shall be resolved through binding arbitration pursuant to the rules of the American Arbitration Association in Miami-Dade County, Florida. Exclusive venue for arbitration shall be in Miami-Dade County, Florida, and you expressly waive all objections you may have to venue or jurisdiction. You also expressly waive the right to a trial by jury and to proceed in any other jurisdiction or forum. The prevailing party shall be entitled to recover its reasonable attorney's fees from the non-prevailing party. Occasionally SantaKnowsMe.co.uk may contact our customers with offers or information related directly to our website, products or services. Should you wish to opt out of this form of contact please email optout@santaknowsme.com. We would love to hear your comments about your experience with the Service. Please email us at info@santaknowsme.com.